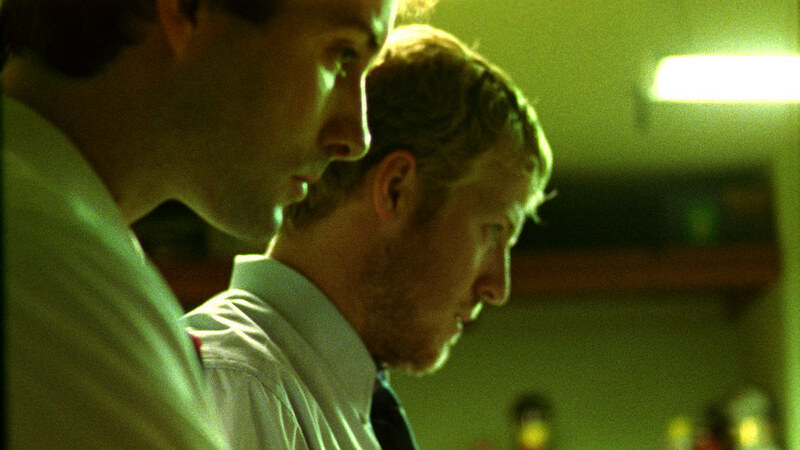 Unless you are really observant you won't understand Primer the first time around. Here is a helpful link that might help you get it. Don't watch it now though. Come back after you have seen the movie. Four men get together to build an error checking device. Not many details are provided on what the device actually does and you can only guess it's purpose by bits and pieces of the conversation that you hear among the friends. They have very limited resources. All of them are employed in a regular job that they can't afford to quit. They come together on night and on weekends to work on their product. All of them are intelligent and hard working guys and naturally they get into a lot of arguments. The first half of the movie focuses on their struggles to assemble a working prototype. Despite their best efforts their calculations always come out wrong. They try many different ideas but success eludes them still. They find themselves unable to pin point the cause of failure. Due to this their relationship becomes stressed giving the viewer a chance to see each person in his true colors. During this half the driving force is Aaron. He comes off as a mature, optimistic fellow who is quick to take action and even quicker to diffuse tension. He wants to build the product no matter what. He goes the extra mile by selling or using his personal belongings for the success of their venture. All of his effort however falls flat. Until Abe makes an accidental discovery and the story starts to pick up pace. Though it is never told explicitly what that discovery was. It succeeds in conveying the confusion of the characters to the the viewer. Like them we are unable to understand what is going on. Hints are dropped that point to the obvious but the words are never said. Suffice to say that they built something that no one ever thought was possible. Which gave rise to a dilemma. What do they do with it? They knew that they "were out of their depth" and that they needed outside help. But they also knew that if they shared their discovery it would only lead to exploitation. So they decide to understand their own system better before they make it public. What follows is the realization that they have in their possession an immense power. The question now is how far they would go to take control. Primer is a very focused science fiction film. Which is an rarity in the genre considering that with the exception of a few ( Gattaca etc) most of the sci fi films are too big in scope. From the start and until the end the action revolves around this device. The movie itself is shot documentary style. There is little music and it all seems unscripted. The visuals are very cleverly done and they provide a level of immersion that I think would have been very difficult to achieve without it. The use of lighting is superb and the change between grainy and clean video output ties itself well with the story. Unfortunately I can not explain it without spoiling the plot but you will know when you see it. Another thing that Primer does well is that it goes to great lengths in establishing the truth of the premise. It never comes out and says "Here, this is the way it is" but instead gives subtle clues to the viewer and make them arrive at a logical conclusion and then take it further from there. It is like reading a good detective novel where you try to solve a mystery as go along. Which brings me to perhaps the only "flaw" that I can find in the movie. It can be a bit too dense and might require some effort on your part. When I watched this movie the first time I was left with a lot of questions and I could not comprehend it completely. Primer requires an active participation from the viewer. There is a good chance that you might not enjoy it the first time. But unless you are really observant you won't understand Primer the first time around. Here is a helpful link that might help you get it. Don't watch it now though. Come back after you have seen the movie.